Contracts are an integral part of conducting business and the necessity for certain contracts can arise from the very start of your company. The following are only some examples of important contracts for startups in California. Founders’ Agreement — If you are going into business with one or more people, having a comprehensive and clear founders’ agreement is imperative. This agreement can be likened to a premarital agreement: it foresees and addresses potential issues that may arise and sets guidelines for dealing with those issues. A solid and enforceable founders’ agreement can prevent a lot of legal conflict and costs down the road. 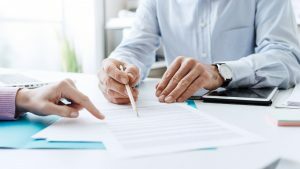 Nondisclosure Agreements — If you have the idea or formula for a unique product or process, you want to keep information confidential so others do not try to misappropriate your idea. However, it will be necessary to share information with co-founders, employees, investors, contract developers, and others involved in the project. In such cases, you may have others sign a nondisclosure agreement to ensure they will not disclose confidential information to other parties. Lease Agreement — The location of your business can be key to your startup’s success, so when you find the right space, you want to ensure you are receiving the most favorable deal possible. Commercial lease agreements can have many provisions that are important to review and consider, including exclusivity provisions, use clauses, common space costs, termination rights, and others. You do not want to sign a lease only to later realize that certain terms of the lease may put the success of your business in jeopardy. Employment Agreements — If your startup requires hiring people, you can have an employment agreement that covers the basic topics: salary, benefits, policies and expectations, and non-compete (where applicable) and nondisclosure provisions, among other things. With a quality employment agreement, you and your employees will understand the relationship and will know what to expect. A properly drafted employment agreement may also help you avoid liability if a disgruntled former employee tries to bring a false legal claim against your startup. Agreements with Customers and Clients — When you do business with clients or customers, you will need to sign a contract with each individual client or supplier. You should design this contract ahead of time to have it ready and on hand when a potential client calls. At Structure Law Group, we are dedicated to helping clients launch their business in the best way possible to set them up for success. We can help with contracts, business formation, intellectual property, and much more. If you have a business idea that you want to turn into reality, you should not hesitate to skilled startup attorneys by calling 408-441-7500 today.